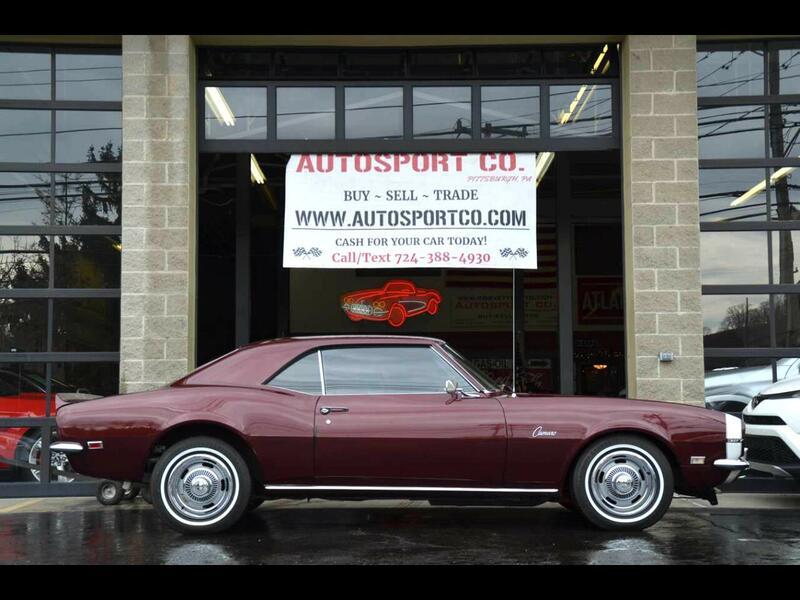 Used 1968 Chevrolet Camaro Only 56k Original Miles ~ Highly Documented ~ Must for Sale in Indiana PA 15701 AutoSport Co. Offered for sales is an extremely well kept example of an American Classic. All information that is given is what the original owner’s family told us and we believe to be true. A schoolteacher purchased this 1968 Chevrolet Camaro new from Needham Chevrolet in Latrobe, PA on 3-30-1968. The original invoice states a purchase price of $3,250.00 and came from the factory equipped with options such as: Front Accent Band “Bumblebee Stripe”, Power Glide, Power Steering, Special Interior Group, AM Radio, and more. The rally style wheels were added years later; however, they give the car the classic look it deserves. Since day one, this Camaro was been Cordovan Maroon and was only repainted 1 time back in the late 80’s/early 90’s so states the original owners family. This car stayed in the original owners family until early 2018. From there the car was briefly owned by a collector and then traded by into our dealership. This car has neverbeen offered to the public, nor has it been advertised. As the odometer and the title states, this car has just over 56,000 original miles, and it shows that it was part of the family. Throughout the binder of paperwork you will find the original “Protect-O-Plate”, the owners manual, warranty paperwork and some receipts from work that was done over the years. Inside the trunk you’ll see many original parts as well as some aftermarket parts the owner had collected/changed out through the years. This is again a great example of a documented, very original 1968 Camaro that is sure to please whomever decides to purchase it.